Over the past two seasons the association has endeavoured to try and change out as many frames as possible in the hives at the apiary. 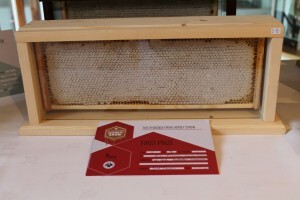 Firstly the older ones can carry bee diseases in the wax residue and on the frames, but more importantly the bees put more honey in newly drawn frames than old ones and we need to give our beginners an opportunity to put frames together properly. The rewards paid off as a frame for extraction was spotted at harvest time that looked like a prize winner and win it did. First prize and a gold medal at the first ever honey show run by the OPW at the Phoenix Park visitor centre in September 2015. The OPW have a beautiful walled garden on the grounds not far from Áras an Uachtarán where the president lives. The show was well supported with a total of 198 entries entered into it. There were plenty activities for the family on the grounds there with the zoo just down the road as well. Great family day out. ‹ Swarmonitor – Whats buzzing?